Just over one month after Apple Pay rolled out to iPhone and Apple Watch users in Singapore through American Express integration, Apple on Tuesday announced new partnerships with five local banks that bring with them support for credit and debit cards issued by Visa and MasterCard. With support from POSB, DBS Bank, OCBC Bank, United Overseas Bank and Standard Chartered Bank, Apple Pay can now be provisioned with more than 80 percent of all Visa and MasterCard cards issued in the country, the Straight Times reports. Apple Pay launched in Singapore last month through a deal with American Express. "Now, almost everyone can leave their wallets at home," Apple Pay chief Jennifer Bailey said. "Apple Pay will be a natural extension of what users have been doing at payment counters." Bringing Apple Pay to Singapore was no mean feat for local banks. Supporting institutions had to install new backend transaction verification systems and other dedicated assets to offer the Apple-only convenience to their customers, the report said. 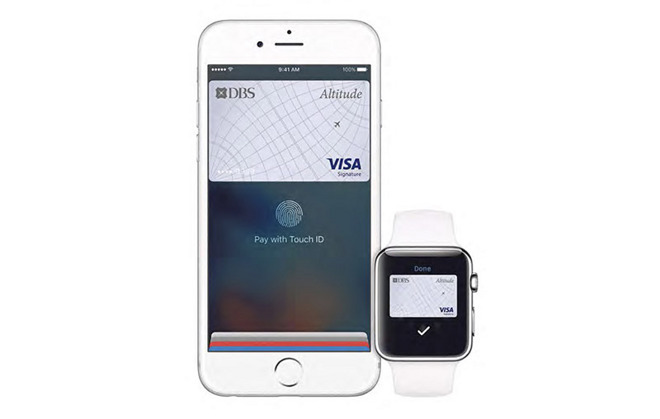 As it stands, iPhone and Apple Watch owners can pay via NFC at some 30,000 stores. Generally, transactions are capped at $100, but at least one bank, UOB, has lifted the limitation for larger retail chains like Singapore Petroleum Company, Caltex and The Coffee Bean & Tea Leaf. Apple Pay was restricted to the U.S. market when it debuted in 2014, but the touchless payments solution has since expanded its footprint to include the UK, Canada, Australia and China.